Threads: DMC, Crescent Colours, & Weeks Dye Works. 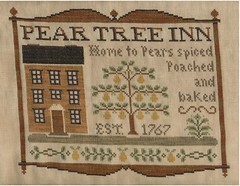 Pear Tree Inn turned out great! Congrats on the finish. Congratulations Nicole on your finishing Pear Tree Inn!! I am doing the lettering now but wish I was all done!! You did a really beautiful job! I hope to join you in the finished pictures soon!!! Good job!! Hurrah on the finish! What a beautiful piece, glad you stuck to it. What's up next? Way to stick with it, Nicole! The reward is your beautiful finish - it's lovely.